Another FIRST FLIGHT in the books. We had eight fellows show up, Morgan Klussman drew the first flight. Pretty cold and windy, but always worth it! 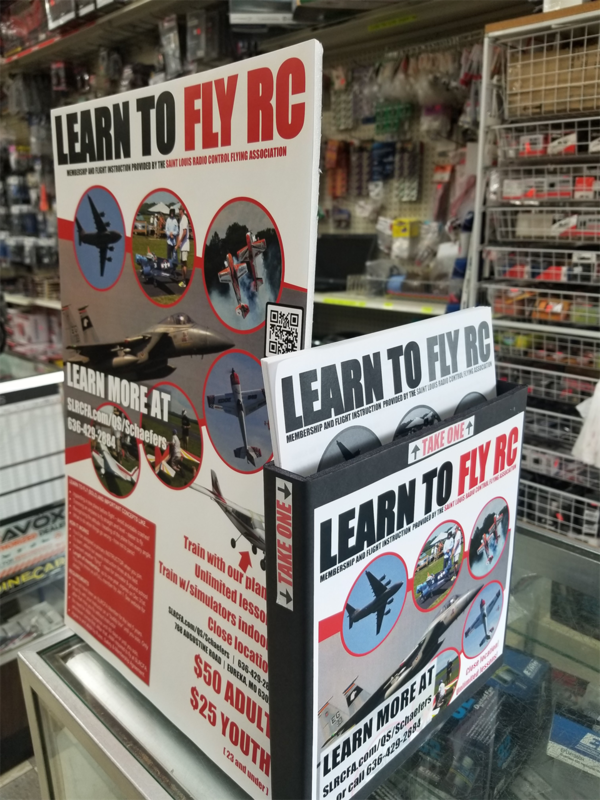 We just placed our first Point-of-Sale display at Schaefer's Hobbies counter for our wildly-successful QuickSTART first-year RC membership, "LEARN TO FLY RC." If you have or know of a business where you think the clientele might benefit from this offer (and like a boost to the bottom line with a little extra margin), reach out to us. Contact info here. Stan King, our long-time SLRCFA president, passed away this week. Stan was a ground-breaking RC pilot who flew even though he was a quadriplegic. Click below for a great autobiography on Stan kept by the AMA. St. Vincent De Paul, the charity that purchased Stan's wheelchair lift. SLRCFA is making a donation to both charities. Actually, it would take a whole lotta chicken dinners to pay for this sharp jet! John Reed won the EARLY BIRD raffle by renewing (or setting his account up for auto-payment) by December 31st. This year, every FULL member who didn't let their membership expire got a ticket. PRIME members got two tickets. Only ticket holder were allowed to purchase additional tickets. 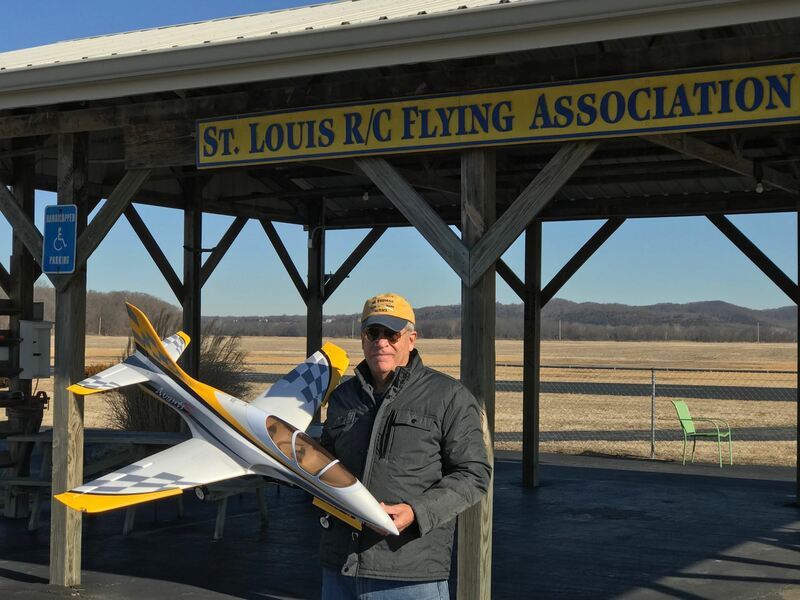 John attended the January 2018 Club Meeting where he won the fantastic Freewing Avanti S 80mm EDF Ultimate Sport Jet - PNP. 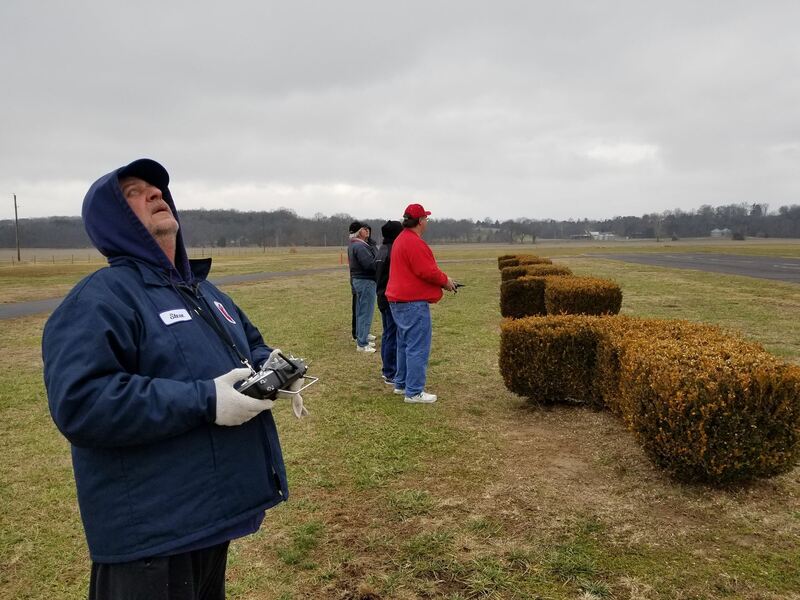 John has now maidened the plane with three spectacular flights on Sunday, January 28, 2018, and is shown above shortly afterwards. Thanks to everyone who participated in the EARLY BIRD renewals/new memberships. It's make a big difference... we had a record amount of cash to start the year, which mean's we're not scratching our head on what the budget will be this year. We also paid our big field bills (lease and property taxes) in mid-December due to the EARLY BIRD program from both December 2017 and December 2018 pulling our cash forward. Basically, we need our money on Jan 1, so we ask you to renew by December 31, and it's a big deal! Well, the show lived up to the hype! Denny Spark's did a fantastic job welcoming us to his shop, demonstrating his approach, and showing us his many, many, many planes. Don't miss our next meeting! We'll have Paul Appelbaum doing a builder's clinic. Click here for more information. 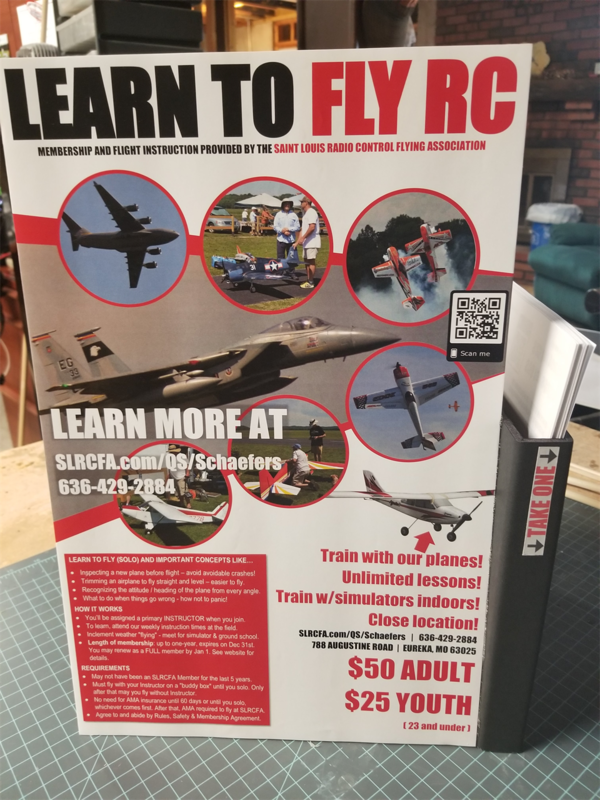 If you fly at SLRCFA, you'll know Jonathon Hendrickson. He's the (relatively young) guy who flies just about everything and knows a lot about all types of aircraft. 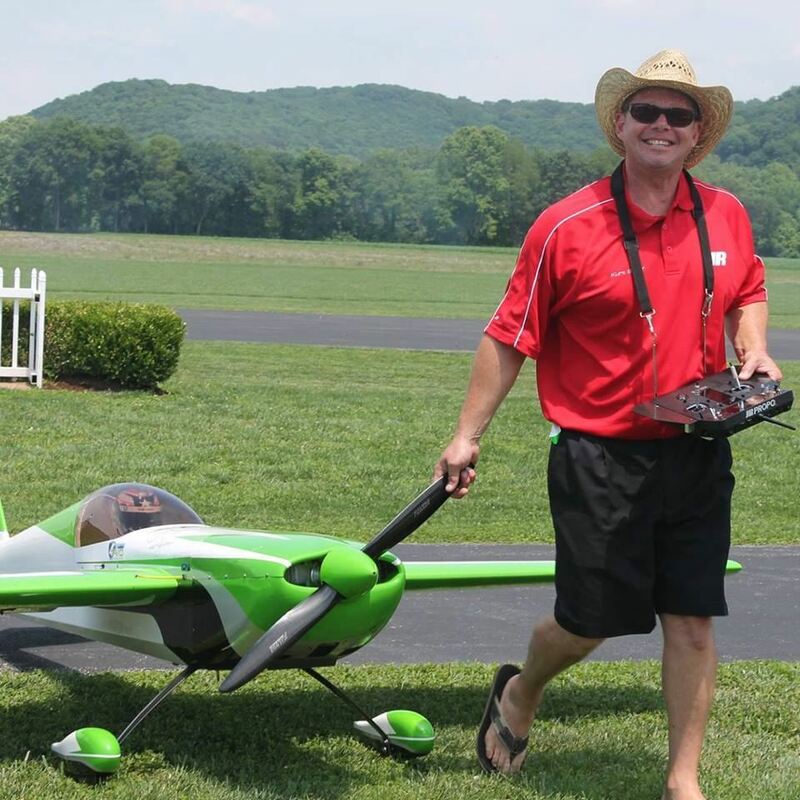 Jonathon is a go-to guy for electric flight, FPV, drone photography, racing planes, battery maintenance, charging equipment, engine tuning, full-scale pilot licensing and even riding mower repair. He even created our Pilot Instruction program. He's "Mr. Know-It-All" in the best way possible. On top of all that, for the last two years, he was the ultimate go-to guy: the SLRCFA President. Jonathon stepped down as President in 2017 after serving on the board since... well, I think since 2007 (I'm not the best record-keeper that far back). The last two years would have been a challenge for any leader, with two floods and a sea-change in our cost structure (and subsequently, dues) due to a large property tax increase. Beyond that, changes in leadership are always potentially difficult, and Jonathon took over from Stan King, who had been President for well-past a decade (Stan was honored with a plaque for service and a lifetime SLRCFA membership in 2016, along with long-time Treasurer, Ron Lawson). Implementation of the QuickSTART program with his Pilot Instruction methodology adapted from a successful RC training regime. We brought on 21 people under this program in 2017. Growth of the club back to 102 members - 36 of them were new in 2017! 2017 ended with an increase in cash in the bank of about $3k, despite the 2017 flood which topped the 2016 flood. ...any many other successful changes too numerous to mention. As outgoing Vice President, I can say that Jonathon was a joy to work with, having a brilliant mind that grasps problems and finds solutions quickly. I truly enjoyed serving with him. Never one to fear some experimentation when change is needed, Jonathon led us exceptionally both as a Newletter Editor, Director and eventually as our President. 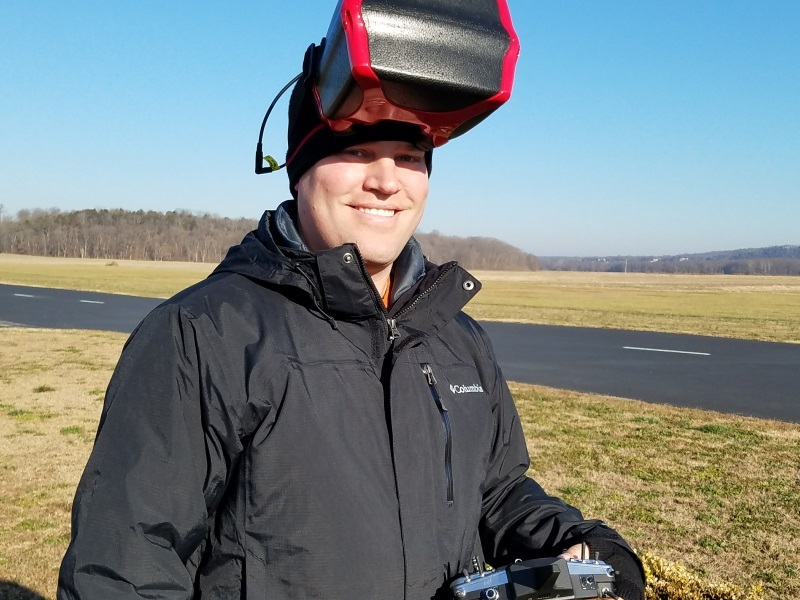 As incoming President, I'm ecstatic to say, we won't have to miss Jonathon: he's continuing as a PRIME member and co-leading our Pilot Instruction Program! 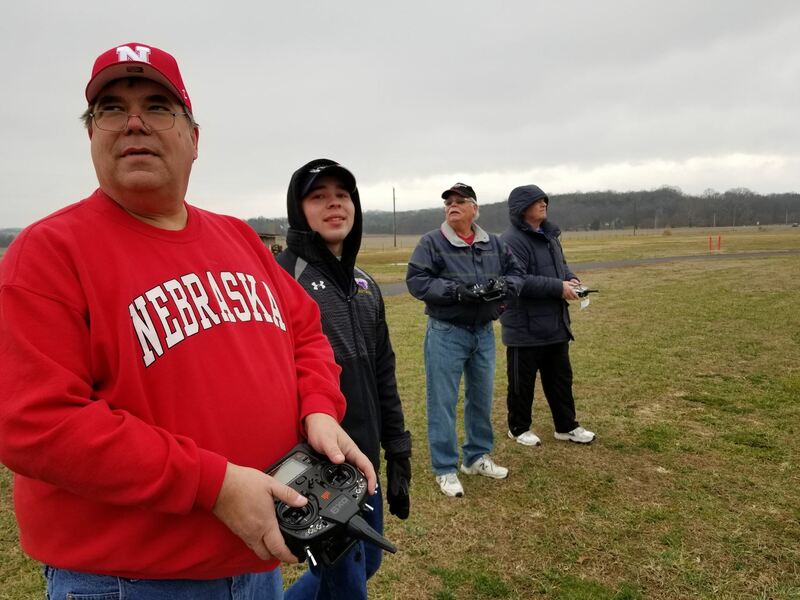 Look for him to say "THANKS," personally, on January 1 at our FIRST FLIGHT and in May at our club meeting where he'll be providing an FPV Primer. Thank you, thank you, thank you Jonathon Hendrickson! December 2017 rolled around and only 12 nominees for the Board of Directors were nominated. All 12 accepted nomination, and all 12 are qualified to serve on the board. 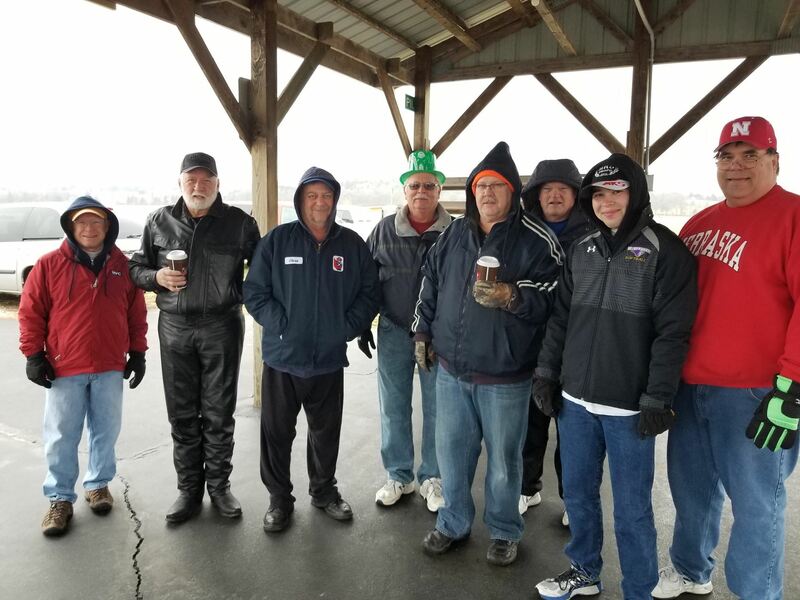 The 12 were the 11 already serving, plus a new Director nominee, Kurt Seiter, the owner of HolySmokes smoke pumps, a long- time member and frequent sponsor of SLRCFA events and activities over the past three years (picture at right). Because only 12 Directors and Officers were serving / nominated, there was no membereship vote needed or held to determine which 12 would serve. Let's change that in 2018! Click here at any time for a complete list of your Board of Directors. 2017 Christmas Party a HIT!!! 102 members - 103 as of the party (one more joined)! Of those 20 new QuickSTART and JUNIOR members that were more-or-less new to the hobby - 21 as of the Party with a new QuickSTART added. 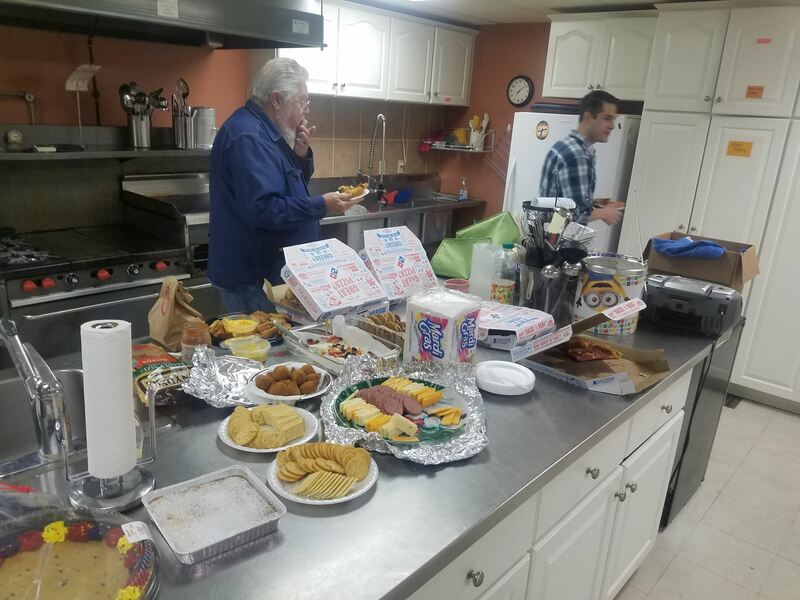 We had lots of food on-hand as people brought goodies to share. 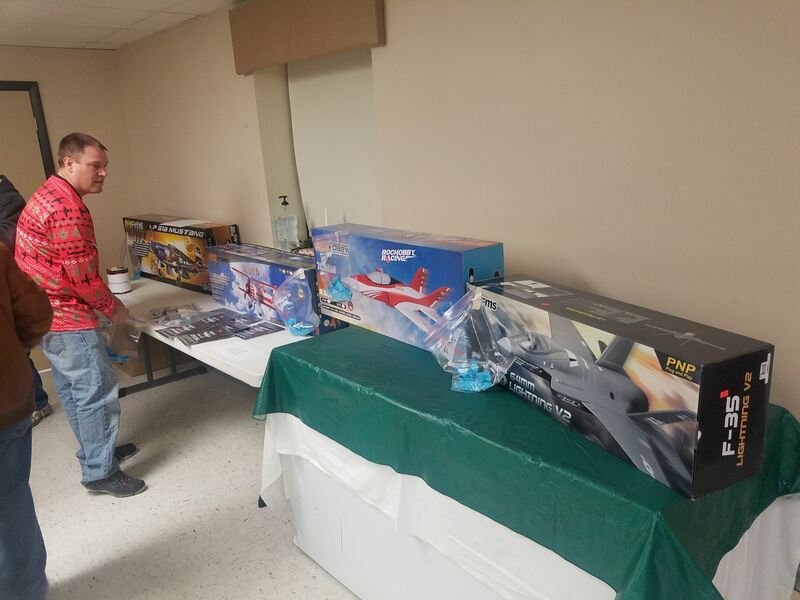 We kicked off the fun with a QuickSTART raffle - the experienced guys brought used or NIB planes that they weren't using and the newbies were able to win. 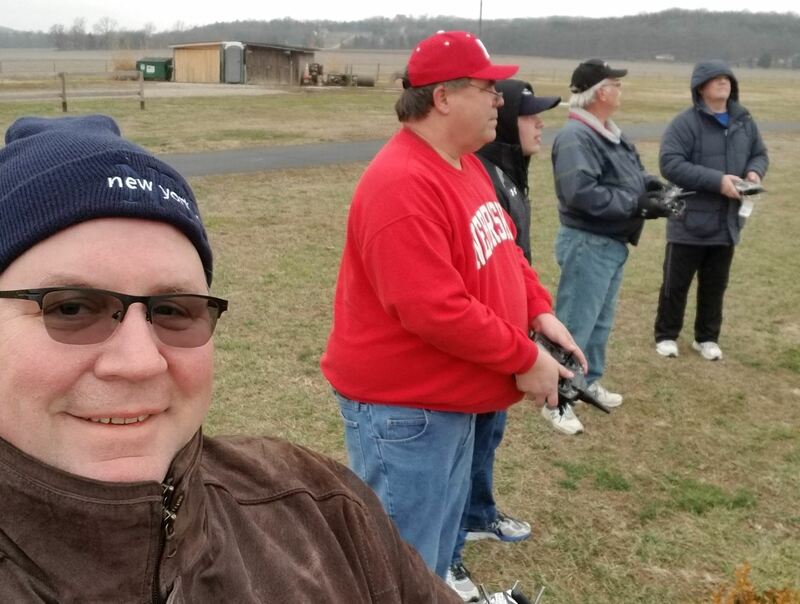 Ken Merrill brought three radios and matching receivers, so several who won planes also won radios to match! Only QuickSTART members from 2017 were eligible to win. Next we did our Dirty Santa gift exchange, which was hilarious. With 45 guys there, it took a while. We'll change the rules to speed things up in the future. Finally we wrapped up with our Christmas Party Raffle. 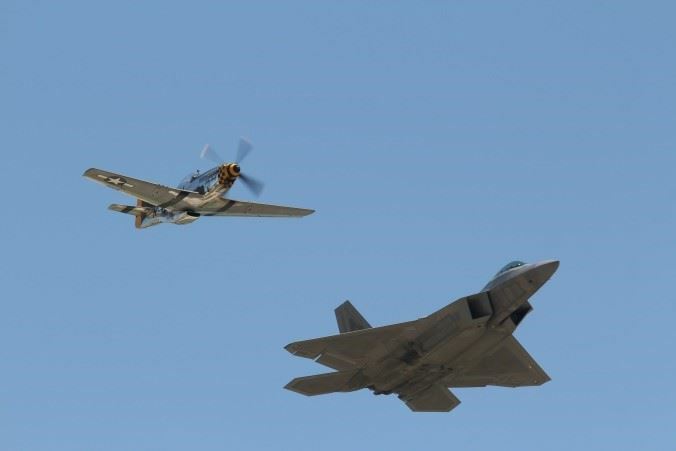 Thanks to Schaefer's Hobby's for four NIB planes (Waco RTF biplane, two EDF jets, and one P51 RTF with retracts). The club made money on the raffles and gave $100 to the Eureka food pantry charity and $40 to the Central Baptist Church in Eureka for facility use. Next stop, 2018 with our FIRST FLIGHT event on Jan 1. Going to be the coldest in memory, so even more fun!